As an orthopedic surgeon, picking another orthopedic surgeon to operate on your own knee is tricky. It was tough enough when my wife insisted that I operate on her knee. She rightly felt that no one else would care about her as much as I did. And since I had invented the procedures to replace her arthritic knee with new meniscus and re-grown articular cartilage, she felt that she was in the best hands . Seven years later, she's still hiking and skiing. But back to my knee. I had lost my own meniscus cartilage to a college soccer injury. I remember the moment of extending my leg to stop a goal and getting twisted up with the ball striker. While I admired the orthopedic surgeon who operated on me, his choice to remove my meniscus was fatal to my knee. Removing it cured the pain, but the loss of that key shock absorber set my knee on an inevitable course to arthritis... While I continued to run and play sports for 20 years, I ultimately had to give up first running, then tennis, then hiking. Eventually, walking any distance was painful. Despite the fact that my entire career was dedicated to keeping people active by replacing their cartilage and biologically rebuilding their knees, I ignored my own until I was obviously limping. The tragic fact is, I had waited too long. I'd destroyed the surfaces of my knee, and had also deformed the bone underneath. Having collapsed into bone-on-bone, now bow-legged, I was beyond the stage when biologic joint replacement procedures could restore my joint. Fortunately, partial knee replacements had come of age. They had emerged from the dark ages--when surgeons used coarse cutting guides with wildly variable accuracy--to a new millennium of computer-driven, robotically-placed implants . 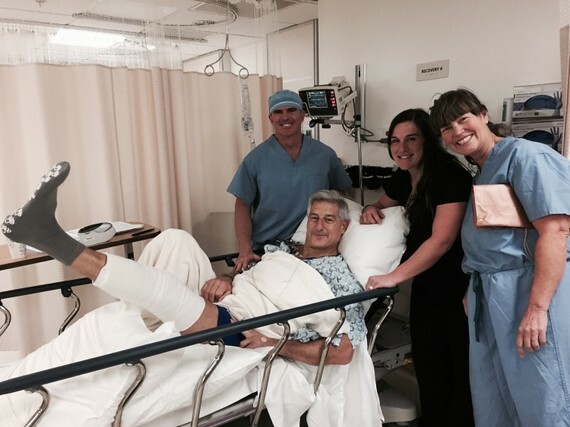 In 2010, I had started the first outpatient robotic partial knee replacement program. It was probably the most satisfying procedure I had performed, and my patients were having tremendous success. They could walk on their new knees immediately, and the pain relief was complete. Prior to my surgery, my nurse and I researched the most experienced partial knee replacement surgeons, and visited several of them in their offices and operating rooms. I studied their techniques, and improved my own. Then I recruited one to join my practice in San Francisco. Part of his job interview was to replace part of my knee. 2. Sommerlath, K., 1988. The importance of the meniscus in unstable knees. A comparative study. The American journal of sports medicine, 17(6), pp.773-7. Available at: http://www.ncbi.nlm.nih.gov/pubmed/2624289 [Accessed September 17, 2014]. 3. Citak, Mustafa, Eduardo M. Suero, Musa Citak, Nicholas J. Dunbar, Sharon H. Branch, Michael A. Conditt, Scott A. Banks, and Andrew D. Pearle. "Unicompartmental knee arthroplasty: Is robotic technology more accurate than conventional technique?." The Knee 20, no. 4 (2013): 268-271.